When Beatriz slams into her room to escape yet another fight between her parents, she turns to Beatrizita, a doll made for her by her recently deceased abuela, for comfort. Beatrizita magically comes to life and sends Beatriz searching for her abuela in Dreamland with nothing but a blank map to guide her. 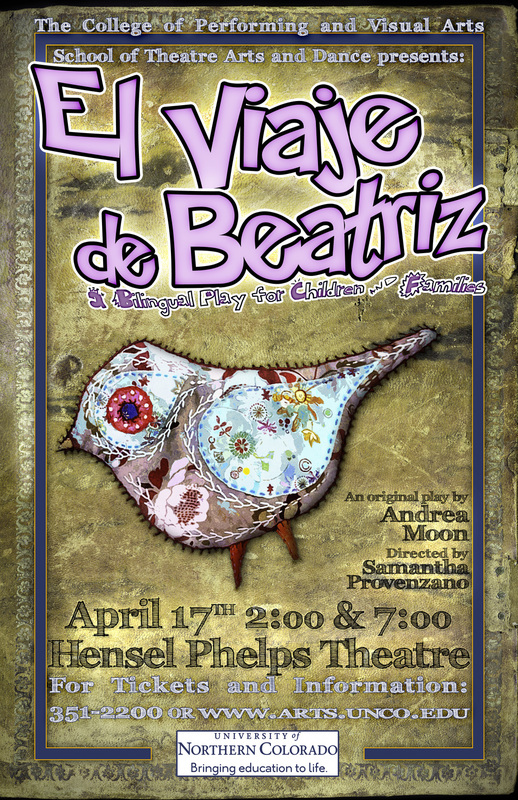 From an entangling forest of living trees through Babble-onia (a land where none of the inhabitants speak the same language), to an audience with the churlish king and queen of Dreamland themselves, Beatriz navigates through her wondrous adventures. Along the way, she discovers the regalitos (little gifts) of spirit that her abuela's kindness instilled within her. Ultimately Beatriz encounters Izquerda-Derecha-Avanzado, a three-headed creature who swirls Beatriz back to her bedroom—without her abuela, but with an unexpected gift. Published by Dramatic Publishing. Click the cover for link to purchase book or rights. Produced by the University of Northern Colorado 2010.